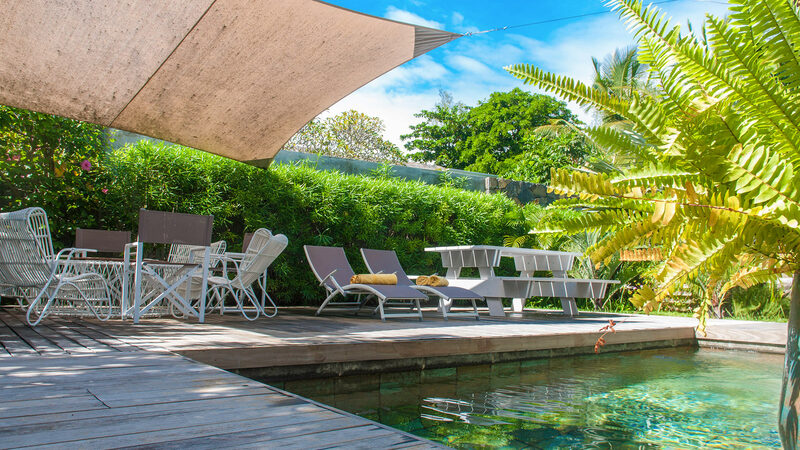 Villa Nautilus 3, located on the Northeast coast of Mauritius, is located on a succession of contemporary houses a few metres from the beach, with a private terrace overlooking a beautiful private garden consisting of exotic plants and green lawns. The architecture and landscaping were designed for a perfect combination of interior and exterior. The villa is elegant, surrounded by exotic gardens and a few steps from a white sandy beach with stunning views of the Indian Ocean and its dazzling waters. The ground floor is overlooking the gardens and the private pool. The living-dining room offers a wonderful view that invites you to stroll on the sandy beach or go for a dip in the turquoise lagoon. The floor consists of spacious and comfortable rooms, an upscale bathroom and a comfortable TV room. 3 bedrooms / 2 bedrooms with double bed / 1 bedroom with 2 twin beds / 2 bathrooms. The villa has quality furnishings, air conditioning, plasma screens with satellite channels, a dining room and a fully equipped kitchen. In addition, the villa has a private pool, with a teak deck around the pool and a small garden with an outdoor shower. The lady of the house, Reshma, works from 8:30 to 12:30 except Sunday and public holidays. Groceries shopping must be made by customers. The lagoon of Roches Noires with its islets houses a great underwater activity. Not far from the magnificent golf courses on the East Coast, the village of Roches Noires is only 15 kilometres from Grand Baie, the North Coast, known for its luxury boutiques, restaurants, clubs and marina. The famous Garden of Pamplemousses is less than half an hour's drive from your residence and you can even reach the capital, Port Louis, in less than an hour. Enjoy the mild climatic conditions of the North of the island, where the cool breezes of the summer, the picturesque surroundings and the sweetness of the locals recall the idyllic description of Mark Twain on Mauritius: "God created Mauritius, and used it as an example for Heaven!" We were very much satisfied about the Villa Nautilus and its interieur, but especially with the service of the maid Reshma.